I don't write exclusively about John very often on my blog, so I'm going to make up for that now with this post. 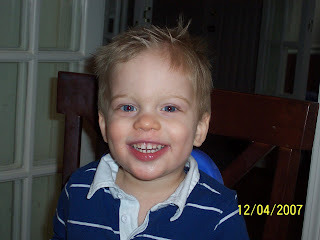 Tomorrow, March 8th, John will turn 3 years old. It's fun and exciting to watch him grow up. What a fascinating thing it is to have a baby grow in you, be born, and become a unique, distinct, actual little person, developing more and more as time goes by. I'm sure that my fascination will only increase as John continues to grow up. We are really blessed with our little boy, and we think John is a remarkable little kid. Since the time he was born he's had a happy, easygoing spirit about him. His personality is really fun: he's friendly, outgoing, social, and affectionate with just about everyone he meets, young and old. I'm still amazed at how he adjusted to preschool when he started two weeks ago--he had no problem with this pretty major change in his life, and he still doesn't. It's as if he's always gone there and it's the most natural thing in the world for him. This adaptability and openness to others is particularly amazing to me because I was a very shy little kid, so I've always admired the outgoing ones, and to have a child who is like that, who comes from me, is really cool. Another thing is that he memorizes animals, instruments, and other named things really well too. For example, he has a bird calendar and will find all of the birds for you, such as the "Red-Breasted Grosbeak," the "Snow Bunting," and the "Carolina Wren." He really likes doing this and wasn't satisfied until he had them all memorized. So we've been pretty amazed at how well his mind works, and it's one of the reasons why we decided to put him into a preschool program where they will teach him at his individual level as he indicates he's ready for it (that's what Montessori schools do). On Monday he has his 3-year check-up and I'm going to ask his pediatrician what she thinks of these skills of his. Maybe it's not that big of a deal, maybe it is, and I'd like to get her opinion on it. Having said all of that, John is a fun, normal kid and he likes doing a lot of normal kid things too, like playing outside, going to the playground, playing with his friends, jumping on his trampoline, playing with his toys and puzzles, watching his favorite videos and TV programs (in moderation, of course! ), going swimming, playing his instruments, playing games like Hide and Go Seek, and, of course, getting into mischief. His favorite person in the world is Daddy, which is appropriate since the two of them are alike in so many ways. I'm looking forward to seeing what happens during age 3 for John. I've heard that age 3 can be much more difficult than age 2, and I have a feeling that may be the case for us. Although John is good and just fine most of the time, he definitely has a dark side that has been rearing its ugly head more frequently. In short, sometimes John drives me nuts. He seems to reserve his worst, most stubborn behavior mostly for me, and when he does, it takes all of my patience and wherewithal to deal with it as best I can. Sometimes I succeed, and sometimes I fail and have a bad mommy day. (As an aside, I truly believe that those we love the most also have the power to drive us the most crazy!) In any case, it should be an interesting year.